Wednesday will mark six months since the S&P 500 reached its last record high at 2,930. Last week's resilient showing nosed the S&P 500 up to a zone that has capped four rallies since October and three between February and June 2018. Wall Street has been helped by the absence of imminent U.S. recession signals, an overt move toward policy patience by the Federal Reserve and sticky-low Treasury yields bolstering equity valuations. Investors have lived for half a year in the shadow of the bear, and now find the the indexes on the cusp of breaking back into the light. The market has burned up a brimming reservoir of pessimism and done just enough to encourage the bulls, without fully disproving the skeptics case that last year's highs will go unchallenged. Wednesday will mark six months since the S&P 500 reached its last record high at 2,930. The 20 percent drop from there to Dec. 24 was among the swiftest in Wall Street history. Its recovery of four-fifths of that loss in less than three months has been at least as extraordinary by historical standards. 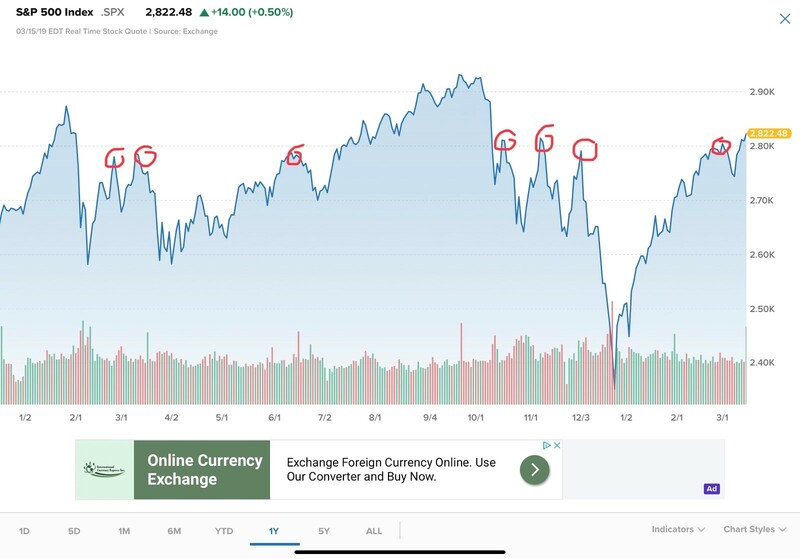 Certain strict market-cycle observers still consider the underlying bull-bear status of the market in play, viewing last September's high as a plausible peak and everything since as the opening movements of a bear market. That's perhaps a semantics exercise unhelpful to most investors, given the market is up a bit over the past year and less than 4 percent below that 6-month-old record. Doug Ramsey, chief investment officer at Leuthold Group, was positioned for a bear phase well before the fourth-quarter slide and remains skeptical, but still grants that the rebound has moved beyond a mere reflex rally: "Based on standard technical retracements and on our mortality tables for bear market rallies, the best-case S&P 500 bounce 'should' have exhausted itself in the 2,700-2,750 range." It didn't. Still, while the recovery has outperformed the bear-rebound playbook, the market has not fully resumed the habits and attitudes emblematic of a humming bull market. And that might not be the worst thing for its prospects through this year. There isn't a catchy or fully satisfying explanation for why stocks have reclaimed so much lost territory so quickly. This explanation is pretty much it: that stocks overshot to the downside, exacerbated by a year-end liquidity air pocket, on worries about economic peril and central-bank error that have mostly gone unconfirmed — and that's now been reversed. The absence of imminent U.S. recession signals, an overt move toward policy patience by the Federal Reserve and sticky-low Treasury yields bolstering equity valuations — this is the palliative cocktail that eased Wall Street's end-of-cycle flu. Earnings forecasts for 2019 are down some 7 percent since October but have stabilized. Credit markets have firmed up, though not back to September levels of risk-acceptance. All this, for now, has been enough to rebuild equity valuations back toward their five-year average based on expected corporate profits. Those slim bond yields — with the 10-year Treasury beneath 2.6 percent and near its low for the past year — have done a lot of the work in supporting stocks. 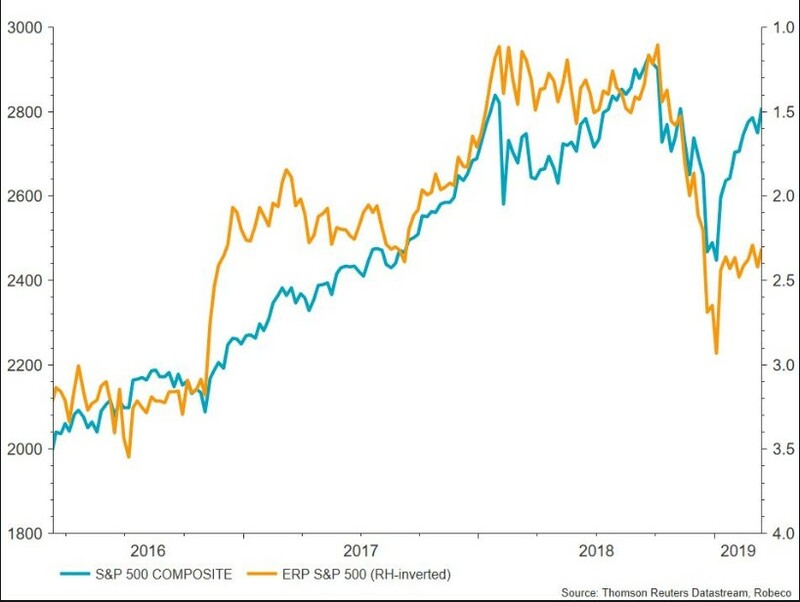 This chart from asset manager Robeco shows the equity-risk premium — the amount the "earnings yield" of stocks exceeds the risk-free Treasury yield — has scarcely eased since December. How much more upside can be wrung from these forces alone? A fair question. Roughly the same factors pushed the forward P/E for the S&P 500 in the first half of 2016 a bit higher than it is now, toward 17. The bullish take: If confidence returns about a resumption of earnings growth later this year, that risk premium has room to shrink through higher stock prices. It's wrong to say that the broad investing public has fought this rally outright, but it's fair to observe the crowd has been late and grudging in accepting it. Sentiment surveys and institutional-investor positioning do not reflect the optimism one would expect after a near-ceaseless 20 percent rally. It's as if the persistence of the rally itself keeps generating concerns that the market has run ahead of itself, which continually rebuilds a wall of worry for the indexes to climb. The leadership of the market speaks to only a half-embrace of the bull case. The recent outperformance of dividend plays and mega-cap growth stocks says yield vehicles and dominant secular-growth companies are being rewarded more generously than smaller, financially riskier and more cyclical names. The Invesco Nasdaq 100 QQQ ETF was up 4.2 percent last week and is ahead by 15.6 percent this year, against 2.9 percent and 12.6 percent for the S&P 500. The small-cap Russell 2000 is down 1 percent the past month. That's not clearly a speculative, risk-on posture. Deutsche Bank notes that from October through early March, investors pulled $100 billion from U.S. equity funds, indicating caution after the steep late-2018 drop. Yet in just the first three days of last week, a heavy $31 billion flowed in — a rush seen only nine prior times in recent years. And, indeed, the late-week climb in the indexes on light, mixed news flow hinted at a belated impulse to chase the rally. Of those nine prior similar bursts of fund inflows, the S&P was down the following month six times for an average loss of 5 percent, Deutsche says. Yet the upbeat exceptions were in 2013 and 2016, when flows had badly lagged a strong stock rally — which resembles the current conditions. Others are pointing out that the coming week follows a big quarterly expiration. These expirations have often coincided with a market trend culminating and reversing (as happened around the September and December expirations). The week after the March expiration has a slight net negative bias, so some spillback in the indexes should surprise no one here. Bespoke Investment Group flags the Cboe Volatility Index (VIX) making a new 100-day low Wednesday near 13. This in the past has had mixed implications, with near-term softness and widely varying but slightly below normal returns a year out. Though all the double-digit year-ahead losses after this signal came in verified bear markets — from 2000-2002 and in 2008. Comforting for those who believe this market will emerge from the bear's shadow, or already has.